Hysteria, or conversion disorder as it is now known, is when neurological symptoms such as blindness or paralysis are present but no neurological problems or brain abnormalities can be found. The issue of whether such patients are ‘faking’, whether the neurological abnormality just hasn’t been found yet, or whether the problem is best understood in psychological terms, has been vexing clinicians for the best part of 200 years. …how can we discover if someone is indeed faking it? (We use ordinary language here rather than the more obviously psychiatric terms such as factitious disorder and malingering: clarity and logic are best served by calling a spade a spade.) The simple but totally impractical solution would be 24-hour surveillance on audio- and video-tape unbeknownst to the patient. Anyone who behaved perfectly normally when alone but who invariably developed the ‘disability’ when in company might be plausibly thought to be feigning. Short of this Big Brother solution, investigators have tried to devise catch-trials and catch-tests to detect the cheater. For example, it is sometimes assumed that a patient who ‘guesses’ a randomized stimulus sequence (touch, touch, no touch…) significantly below chance must be faking it. But the existence of such phenomena such as blindsight, unfeeling touch, unconscious perception in visual-spatial neglect and priming in amnesia show how misleading it can be to assume that odd relationships between behaviour and verbal report necessarily constitute evidence of cheating. We do not impinge on the honesty of patients who perform visual discriminations at above chance level while claiming to have seen nothing. Why should we perforce distrust those who score below chance? In short, the detection of lying in the neurology clinic is at least as difficult as it is in a court of law. Link to previous Mind Hacks article on hysteria. Link to great NYT article on hysteria. The Washington Post has an article on the ongoing trial using MDMA (‘Ecstasy’) assisted psychotherapy to treat post-traumatic stress disorder. Babies learn how to make social evaluations in the first few years of life, according to a new study reported by BBC News. The Guardian has an article on combining a high-flying career with ongoing mental illness. For men the brain activation in the ventral striatum is dependent not only on the size of reward, but also how it compares to other people’s rewards. Google in your brain? PageRank as a semantic memory model: Developing Intelligence examines an interesting view on memory for facts. Is the beauty of a sculpture in the brain of the beholder? Stupid headline, interesting study. A great post from Mixing Memory on a favourite experiment: research on schema (like mental frameworks) for memory. Is the famous Christian poem ‘Footprints’ a case of cryptomnesia: the unconscious copying of another creative work? Rachel Aviv for the Poetry Foundation investigates. Cognitive economics comes to the aid of football goalkeepers, via the BPS Research Digest. The University of Virginia has a great ‘Psychedelic Sixties‘ online exhibit. Neurophilosophy finds a wonderful image generated from a supercomputer simulation of brain microcircuitry. The Dana Foundation has an excerpt from Sandra and Matthew Blakesee’s new book ‘The Body Has a Mind of Its Own’ available online. Are rocks conscious? Arguing no is harder than you think, and the New York Times covers controversy. Probably one of the most important emerging fields in biology is epigenetics. Corpus Callosum tackles a new study on the epigenetic transmission of PTSD risk markers. Can you think of a substitute for this? Ohh no! Don’t forget your brains! I noticed this on the menu of a restaurant on Great Russell Street while strolling through London. It seems to be one of a number of curious commentaries on each of the menu items. While presumably serving as a sort of disjointed advert, it also seems to work as general life advice. I’m just reading a book called The Head Trip: Adventures on the Wheel of Consciousness which sounds like some stoned hippy opus, but is actually a wonderfully written travel book into the neuroscience of naturally occurring altered states of consciousness. It was recommended to me by Tom, who got sent a copy to review, and was so enthusiastic about it, he sent it to me afterwards. And I’m very glad he did. He skilfully compares the myths, claims and speculation with what is known from scientific studies, and what he managed to experience himself. There’s quite a large section of the book dedicated to sleep and dreaming, and if ever you thought sleeping was the uninteresting third of your life you spend unconscious, this is the book which will make you think again. Just great fun, and, if you’ll excuse the slightly awkward metaphor, wonderfully eye-opening as well. In the meantime, if you want a quick fix on the science of dreaming, the Washington Post had a recent brief article that discussed the topic. This week’s New Scientist has a cover story on the psychology that goes on behind the scenes, in the subconscious. Or you could call it the unconscious, or the pre-conscious. Despite the differences in terminology it’s much the same idea. Essentially, it’s the work the brain does that we’re not conscious of. Subconscious thought processes may play a crucial role in many of the mental facilities we prize as uniquely human, including creativity, memory, learning and language. Next week: Sea contains water! Don’t be put off though, the article’s actually a good guide to some of the latest theories on how information crosses the consciousness divide. What’s more, non-conscious thinking may actually work best in some cases where you might imagine rational, conscious thought is the best tool for the job. In situations where people have to make difficult choices based on large amounts of hard-to-assess information, psychologist Ap Dijksterhuis at the University of Amsterdam in the Netherlands has found that they are happier with their decision when acting on gut instinct than when forced to try to think the choice through rationally (New Scientist, 5 May 2007, p 35). Dijksterhuis is convinced that subconscious thought processes are superior in many situations – including most social interactions – because they allow us to integrate complex information in a more holistic way than can be managed by rational thought processes. Something similar sometimes happens in problem solving, according to Jonathan Schooler from the University of British Columbia in Vancouver. By asking subjects to explain their reasoning as they go, he has found that verbalising what they are doing has no effect on people’s ability to solve analytical, mathematical or logic problems but actually hinders performance on insight problems, such as solving a riddle – those for which the solution seems to pop out of the blue in an aha! moment. Remember that subconscious thought processes differ from conscious ones in that we are unable to articulate the former. So here, it seems, is experimental evidence for something we all instinctively know: that subconscious thinking is the source of our inspiration – it is central to creativity. Rather ironically, for an article on the unconscious, it’s been hidden behind a pay wall. So you’ll need to get a copy from your newsagent, or if you want to expand the subconscious mind, photocopy it in the library. Link to table of contents for this week’s NewSci. i.e. whether the affection is one which pertains to the faculty of intelligence or to that of sense-perception; for these are the only faculties within us by which we acquire knowledge. The opening lines of Aristotle’s early sleep text On Dreams, written in approximately 350 BC. In George Orwell’s dystopian novel, 1984, Winston Smith works in the Ministry of Truth retouching photographs to remove people from the record of history. A recent psychology study suggests that these manipulations may change more than the historical record, they could affect our collective memories of what actually happened. In the study, led by Italian psychologist Dario Sacchi, participants were shown two photographs; one from the 1989 Tiananmen Square protests and another from a 2003 protest in Rome against the Iraq war. What they didn’t know was that some participants saw doctored versions of either one or both of the photographs. 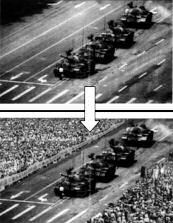 The image on the left demonstrates that a crowd was added to the Tiananmen Square image. With the Rome photo police and aggressive-looking demonstrators were added to the image of peaceful protesters. To test whether people perceived the photos as genuine or not without giving the game away, the researchers asked participants how familiar they were with the image. Both groups rated the Tiananmen Square photo as equally familiar, suggesting few picked up on the changes. Interestingly, participants rated the altered Rome photo as less familiar, but when given a chance to comment, no-one suggested it was fake, with some suggesting that their memory of the protest being peaceful, rather than the photo, must be mistaken. The participants were then asked to answer questions about the events from their memories of what happened. Those who saw the altered Tiananmen Square image remembered more people being there, those who saw the Rome image remembered it as more violent, more negative, and recalled more property being damaged and confrontations with the police. When the experiment was run again, participants additionally rated themselves as less likely to attend a demonstration in future. The study has obvious implications for propaganda and the paper spends much time discussing the possible impact of doctored photos on public opinion. Combined with some earlier studies that suggest that people often believe initial false news reports even when they’re aware of them being falsified, you can see how the media has a powerful influence over our remembered realities. Link to write-up from LiveScience.